No sooner had PM Theresa May announced her decision to go to the country in a snap election predicated on a single issue Brexit strategy, the leader of the opposition, Jeremy Corbyn, was quickly out of the blocks in his attempts to wrong-foot her. Corbyn’s first General Election campaign speech and Q&A in which he outlined a broad set of policies to tackle growing inequality and reverse years of Tory austerity, was a tour de force. The Labour leader’s critics – including many within his own party – argue he is unelectable. However, Corbyn’s political record would suggest otherwise. In his constituency of Islington North, Corbyn inherited a majority of 4,456, which is now 21,194. He’s one of the few Labour MPs whose vote increased between 2005 and 2010, when he added 5,685 to his majority. Although Corbyn is currently well behind in the polls, it must be remembered that pre-coup, Labour led the Tories in three polls in a row over 41 days. Also, Corbyn’s record at elections is exemplary. London and Bristol now have Labour mayors, rolling back years of Tory dominance, while Labour’s majorities in by-elections have generally increased. It’s true that the by-election in Copeland was a major disappointment but this was largely offset by Gareth Snell who took the Stoke seat. Moreover, as George Galloway pointed out, prior to that, Labour won three local government by-elections – two off the Tories and one off the SNP. In last May’s local elections, the party overtook the Tories in the share of the vote, coming from seven points behind in the last election. Meanwhile, the party haemorrhaged 4.9 million votes between 1997 and 2010 under the ‘triangulated’ leadership of Tony Blair. The man who took the country to war in Iraq under a false prospectus, and who lobbies on behalf of some of the world’s most brutal and corrupt dictators, claimed in a moment of Orwellian doublespeak that Corbyn is a disaster for the party. Given Blair’s toxicity, this can only be beneficial for the current Labour leader’s fortunes. There are other potentially toxic issues that Corbyn can capitalise on. For example, May’s unpopular campaign focusing on grammar schools is likely to play into Corbyn’s hands. Unfortunately, this gain could be offset by his misjudged Brexit strategy prior to May’s announcement which I commented on here. But as I state below, this situation is not irreversible. Other issues that the Tories won’t be able to hide away from, is the chaos in the NHS and social care sector, the scandal of zero hours contracts, in-work poverty and welfare cuts among others. Ultimately, the implication the public don’t necessarily favour Corbyn’s politics is wrong. His position on the NHS and the re-nationalization of the railways, for example, are universally popular. Rather, it’s more the case that the elite political-media establishment know Corbyn is incorruptible and therefore feel they are unable to win him over on their own terms. Consequently, they realise that the longer Corbyn remains at the helm the more likely it will be that those sympathetic to him and his policies will be elected into positions of power. The fact that the media barons are constantly drumming it into the public’s heads that Corbyn is useless and needs to resign, is a testament to his unflinching endurance to see through the mandate entrusted upon him by the rank and file. If the right-wing Tory media herd are so convinced that he is useless and has no chance of winning the next General Election, why would they keep insisting that he resign? Moreover, the criticism often leveled at Corbyn that he provides weak opposition at the dispatch box during PMQs, is belied by the fact that under his leadership the Tories have been forced into some thirty policy u-turns. May’s apparent control freakery is underlined by what Ash Sarkar, describes as “a moment of short-term political opportunism which actually has potential catastrophic effects in terms of a concentration of power in the executive.” This is given further credence by the PMs decision to refuse to take part in a televised public debate, her banning of both the public and journalists from Tory events and the insistence that her MPs sign a three lock pledge. May’s autocratic style, indicative of her reluctance to allow proper democratic scrutiny or debate, points to her lack of intellectual acumen and the paucity of her campaign policies. The latter point has been picked up on by some establishment commentators. Columnist Fraser Nelson, for example, revealed in the Telegraph (April 21, 2017), that May’s election manifesto is likely to be extremely light in both content and detail which a single hard Brexit strategy implies. The reliance on a constituency of right-wing extremists to argue for the Tories’ return to Downing Street-based on a hard Brexit, while ignoring the key bread and butter issues, is a risky one and could easily play into the hands of her political opponents. A major beneficiary of such an approach will almost certainly be the pro-Remain Liberal Democrats which could significantly split the Tory vote. Of course, the billionaire-owning mass media support the Tories with near unanimity. 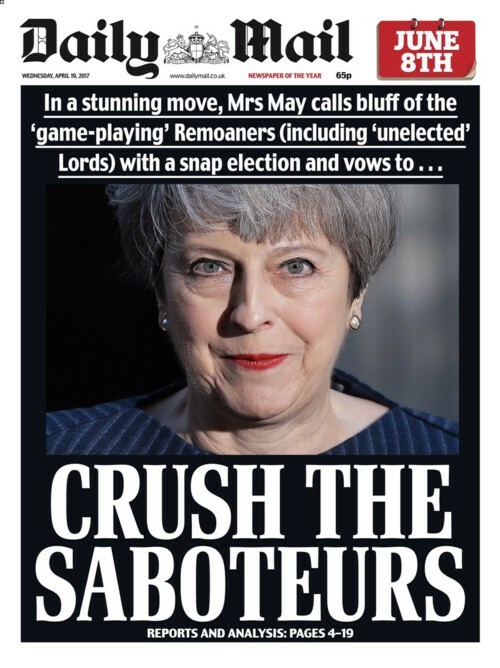 But the front page of the Daily Mail (April 19, 2017) which ran with the headline “Crush The Saboteurs” (see below), is likely to alienate 48 per cent of the population who voted Remain. Therefore, the right-wing media’s depiction of over 16 million people as “the enemy” could realistically backfire on the Tories. It was music to this writer’s ears that Corbyn began his campaign emphasising Labour’s policy plans in a lucid and persuasive way. But in my view, he needs also to ensure that voters are to be under no illusion that the hard Brexit May is offering is not what people voted for. He needs to come out and say so unambiguously. In this way, he has every chance of capturing a great swath of the Lib-Dem vote.